June brings another edition of the Houweling’s Tomatoes Vine Online. Featuring our Roasted Strawberry Tomato Crostini recipe, it is a simple recipe that can make you look like a real gourmet if you bring them along to a summer party. My favourite selection from the June Vine is the comment we received from M. Brown of Twentynine Palms, CA. I am very proud of our locally grown produce, both from Camarillo, CA and Delta, BC. I’m a firm believer in buying American whenever possible and it appears M. Brown does to! 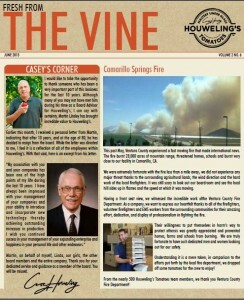 If you have a moment click on the image above to see the entire publication where we send our thanks to the brave men and women of Camarillo Fire Department who did a tremendous job of containing the huge fire in the area earlier in May, a feature to a trusted board advisor who is retiring and much more from our departments. Click the image below to read the June 2013 Vine en Espanol. This entry was posted in Business, Culture, Greenhouse Grown, Newsletter, Tomatoes and tagged Camarillo Springs Fire, Fresh, Greenhouse, Growing, Recipes, Roasted Tomatoes, Seed to Plate, Strawberry Tomatoes, Sustainability, Sustainable, Tomatoes, Vine-ripe. Bookmark the permalink. Comments are closed, but you can leave a trackback: Trackback URL.